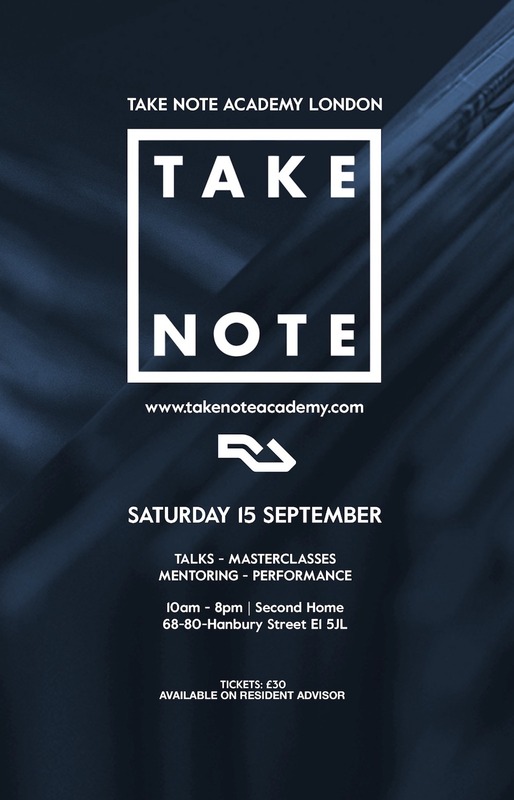 Take Note Academy is set to return to London this summer for a daylong event at East London design space Second Home Saturday, 15th September. Billed as London’s first music conference for young people, Take Note Academy, in partnership with Resident Advisor, “aims to educate, inspire and connect the next generation, bringing together those who will shape the future of the music industry,” according to a press release. This year’s event will feature a day full of talks, master classes, one-on-one mentoring and a live performance with an as yet unnamed artist. Confirmed daytime discussions include events with artists and producers/DJs like BBC Radio 1’s B.Traits, Ben Pearce and HAAi as well as industry reps like Pedro Vila, tour manager with Drumcode; Dominic Flannigan, A&R manager at LuckyMe/Warp; Vidhi Gandhi, A&R manager at Ninja Tune; artist manager Steven Braines; and more. The master classes, which will focus on DJing, production and broadcasting, will feature Cassy, Matador, Kasra and others. For more information on and tickets to Take Note Academy London, visit the Resident Advisor event page. Check out a DJ master class with Andrea Oliva from Point Blank at IMS Ibiza 2018. Photo taken from Take Note Academy London Facebook page.